Tweety Bird Birthday Cake & Cucpakes, a photo by CAKE Amsterdam - Cakes by ZOBOT on Flickr. 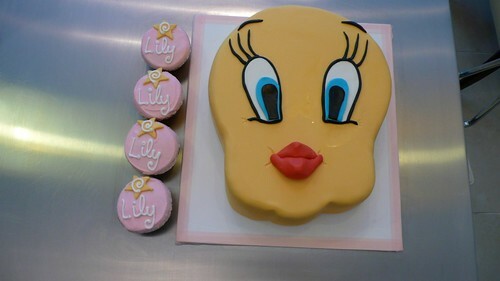 2D Tweety Bird Cake and cucpakes for little Lily who looks like Tweety! Flavor: Chocolate Cake with whipped cream, jam and fresh fruits & vanilla cupcakes with pink royal icing.